A Deadpool MUNNY Zipper Pull from Kidrobot has been announced for pre-order. Thanks to PoolFan for the tip. 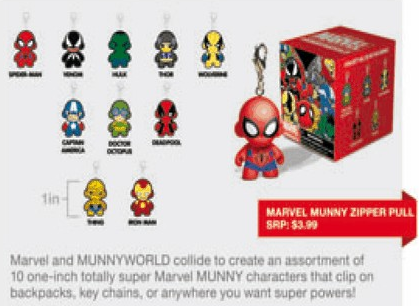 Give your backpack, briefcase, and anything else with a zipper a little Marvel Comics makeover with these Marvel MUNNY Zipper Pull Vinyl Key Chains! This 4-pack includes 4 blind-boxed vinyl key chains. Walk around with some pep in your step when you've got Deadpool, Spider-Man, Venom, Iron Man, Wolverine, and Marvel superheroes from the pages of Avengers, Fantastic Four, and more series at your side. These 1-inch tall, blind-boxed vinyl mini-figure key chains not only look cool but they're the perfect size for desk decoration if you don't want to clip them on to luggage and travel items! Let Marvel add a little comic book color to your life with these awesome looking Marvel MUNNY Zipper Pull Vinyl Key Chains!